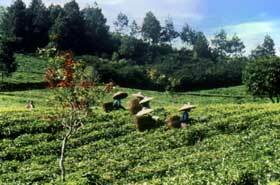 There are numerous places around Jakarta which provide welcome relief from the frenetic pace of city life. Check out some of the following for your weekend piece of peace. Situated up in the highlands to the south of Jakarta, Puncak pass is probably the most popular weekend destination for Jakartans. The vast area of Gunung Mas (Golden Mountain) is carpeted in thick green tea plants, and offers magnificent views over the landscape as well as beautifully fresh air. Wide ranging accommodation facilities provide everything weekenders or longer staying guests could need. From tranquil family bungalows to little homestays, or larger hotels with meeting room facilities, tennis courts and business centers, Gunung Mas has something for everyone. In addition to plenty of space to roam free, guided tours into the plantations are available which allow you to witness first hand the way in which tea is harvested and processed. Located about 60 km south of Jakarta, the refreshing hill-town of Bogor was chosen as the site for the palace of the Dutch Governor General in 1745. The palace was restored in 1832, and stands beside 87 hectares of botanical gardens, with deer ambling around its expansive lawns. Visitors may amble around the gardens, which are home to more than 15,000 species of tropical plants and trees from all over the world, including the world's largest flower, the foul-smelling Rafflasia. The orchid house displays more than 3000 different varieties of orchid. Next to the gardens there is a zoological museum with some impressive exhibits, including an impressive library of rare old botanical books. This 35-hectare park is home to numerous species of Safari animals, as well as some of the rarer animals from around Indonesia. Located 75km south of Jakarta, the park is drive-through - keep your windows closed, and get up close and personal with lions, bears, elephants, giraffe, albino tigers - the lot. Adjacent to the park are recreational grounds with swimming pool, tennis courts, children's playground, amusement park and all the restaurant facilities to make this a great family day out. Formally a sleepy fishing village on the south coast, Pelabuhan Ratu has grown into a well-known holiday resort. It remains peaceful and unspoiled, however, with very few people on the beaches and the surrounding hills still home to traditional lifestyles. The drive to the coast takes a little over three hours, and is in itself a great sightseeing excursion through thick rainforest and along cliff-tops plunging down to sandy beaches. A 15km breathtaking coastline stretches from Pelabuhan Ratu to Cisolok, a small village where you can find hotsprings. Adjacent to Pelabuhan Ratu is Cimaja, a rocky beach well known to surfers. For swimmers, beware of strong currents all along this stretch of coastline. A particularly impressive sight at Pelabuhan Ratu is that of the fishermen out in their boats at night; all that is visible are the glowing specs of their lamps, merging into the stars in the sky. This resort is about a three-hour drive along the highway to the west of Jakarta, and has a great beach for swimming, as the waters are relatively calm on this side of the island. A five-minute boat trip from the coast will bring you to some good snorkeling sites too; accommodation and restaurants are widely available.